(B) 74% | More than Satisfactory Notes: It could do with a more elaborate mythology. Improving on the first book, it’s still, for a fantasy, not terribly exciting. Reviewed by K. Osborn Sullivan for TeensReadToo.com He's rude. He's surly. He won't hesitate to tell you when your haircut looks stupid. And in over 5000 years, he's seen some bad haircuts. I'm talking about my favorite djinni, Bartimaeus, back in book two of his young adult fantasy trilogy. THE GOLEM'S EYE is an excellent sequel to the first book in the series, THE AMULET OF SAMARKAND. In the first book, we meet Bartimaeus, an ancient creature of enormous power that can best be described as a ty Reviewed by K. Osborn Sullivan for TeensReadToo.com He's rude. He's surly. He won't hesitate to tell you when your haircut looks stupid. And in over 5000 years, he's seen some bad haircuts. I'm talking about my favorite djinni, Bartimaeus, back in book two of his young adult fantasy trilogy. THE GOLEM'S EYE is an excellent sequel to the first book in the series, THE AMULET OF SAMARKAND. In the first book, we meet Bartimaeus, an ancient creature of enormous power that can best be described as a type of demon. Unfortunately, he and all of his kind hate the word demon. He classifies himself as a djinni, so we'll just go with that for the purposes of this review. Why annoy anyone who can shoot magical firebolts at you, right? Anyway, Bartimaeus, and other creatures like him, are summoned by human magicians to do their bidding. Needless to say, this forced servitude, or slavery, is not popular with the servants, so they do their best to turn the tables on their human masters whenever possible. Enter Nathaniel, a boy who is in training to become a powerful magician. In book one of the series, he summons Bartimaeus from the netherworld and an involuntary partnership begins. In THE GOLEM'S EYE, young Nathaniel again finds himself in need of the djinni's aid, so he again turns to reluctant Bartimaeus. This time, a revolutionary group is blowing things up in London, which may or may not be related to a series of unusual occurrences that have the police stumped. Nathaniel feels that his career would take off if he can solve these crimes. But the stakes are high because he knows that his career, and possibly his life, are in jeopardy if he fails. A key part of THE GOLEM'S EYE storyline centers on the activities of a London resistance group that is fighting to overthrow the magicians' government. Nathaniel's inability to track down these criminals is part of the reason he needs Bartimaeus's help. Of course, the djinni has little interest in helping magicians maintain their dominance. After all, they're the ones who continually force him and his kind into servitude. This conflict of interest makes for some entertaining scenes and conversations. If you have not read THE AMULET OF SAMARKAND, I strongly recommend you pick that one up before diving into THE GOLEM'S EYE. Technically, you don't have to read the first one, but there is an awful lot of background you will miss if you don't. Plus, it's really fun. Normally I find myself disappointed in sequels. Somehow they never seem to live up the expectations established by the original. But in this case, I was pleasantly surprised. This book is full of excitement, political intrigue, and humor. Bartimaeus is back with all of his cheeky comments, and there are plenty of thrills to go around. Overall, a great book. I was really looking forward to reading this second novel in the Bartimaeus series. I was quite curious to see what it would be like, not just in the sense of the development of the story and the characters, but of the world building as well. I kept wondering how will this world ruled by magicians develop further? I was eager to see what place will our protagonist Nathaniel take in it, will he become like the rest of them (i.e. all the other corrupted magicians)? The world that the author create I was really looking forward to reading this second novel in the Bartimaeus series. I was quite curious to see what it would be like, not just in the sense of the development of the story and the characters, but of the world building as well. I kept wondering how will this world ruled by magicians develop further? I was eager to see what place will our protagonist Nathaniel take in it, will he become like the rest of them (i.e. all the other corrupted magicians)? The world that the author created in the first novel was of great interest to me. In the first novel, I found the setting as fascinating as the story itself. I must say that I wasn't disappointed with how the world building evolved in this one. This sequel was wonderful, an absolute joy to read. Often the sequel disappoints, not being able to retain its original charm, but not this time. It is obvious that the author already had things worked out in his mind because everything seems to flow naturally. This sequel opens up as a mystery novel. Nathanial has to solve the mysterious attacks that are bringing shame to the government. He is utterly engrossed in this task, for his career and his life, depend on his ability to solve the mystery and find the group that is behind these attacks. There are many twists and turns in The Golem’s Eye and many secrets to be discovered. In fact, the secret identity of the person behind the golem’s eye is only one of them. This is an excellently plotted novel with enough food for the thought- or at least that is my experience. If one cares to, one can draw many parallels to our own world, just switch the magicians with modern politicians. The magic could be used as a metaphor for power and money. In this alternative world, the general public doesn’t have much say in anything. It is understood that the magicians know better and that the commoners should just look after their own business and stay out of magicians’ way. In other ways, exactly like democracies in Europe and USA. As far as I can recall, nobody asked us, the European public, would we like to stop trading with Russia? There was no referendum on that subject in any EU country. I’m not an expert on economy, but one doesn’t have to be to know that the record high unemployment in Europe is a sign of economic collapse and you don’t need to be one smart cookie to figure out that a bit of trade would go a long way right now. Likewise, I didn’t notice that American politicians are consulting the public on the subject of whether it is a good idea to provoke a nuclear superpower into a war? If some politician decides it is time to go to war, that’s what happens. Nobody asks the public anything. Yes, we get to choose between people serving identical power groups every few years but that doesn’t amount to much, does it? If it seems to you that this scenario where one small group dominates another larger group seems unlikely, think again. I swear this real world we live in sometimes sounds more ridiculous than a third-rate fantasy novel. No wonder I feel the need to escape it by reading first class fantasy novels. This novel seems a lot more logical and better thought through than our own ‘real’ world (and the sense of humour is right up my alley, so no wonder I like it so much). I mean there is a logical explanation to why people don’t rebel against politicians/magicians in this novel, they have a complete control over the schools, the media, the education, every aspect of life. What is the explanation for general public being so passive and believing everything it is told in our world? Golem’s Eye does give us plenty of explanations as to why this world is the way it is, but this time the dynamics of a narrative are a bit different, it is no longer only about the boy and the djinn, now it there is another character that takes the prominent place. When I wondered, what characters would be a part of this sequel, I didn’t expect any of the old ones to reappear (I mean at the end of the previous novel, most people surrounding Nathaniel are killed and off he goes to be the part of the elite). I completely forgot about Kitty, a girl that shows up shortly in the Bartimaeus narrative and makes a fool out of him. Well, she turns out to be an important character in this novel and there is a good reason for her introduction for it makes sense not just in terms of the plot but in adding a human dimension to this novel. You see another thing I wondered about was what the relationship between the boy and the djinn would be like in the sequel. I took it for granted that there will be a relationship between the two of them. I assumed that the boy will, despite promising otherwise, summon the djinn to serve him once again. I was not mistaken, for Nathaniel indeed summons Bartimaeus when he finds himself in trouble. I guess we can give him some credit for at least attempting to avoiding his promise. What make the dynamics of their relationship so interesting in the first one is the fact that Nathaniel is vulnerable to Bartimaeus because the spirit knows his name. In addition, Nathaniel’s naivety (not to mention young age) made him less like other magicians. However, Nathaniel of Golem’s Eye, is not a very likeable character. He is only a few years older, but he is very much changed. Bartimaeus still can negotiate with him, because he knows his secret, but the relationship between them is different. Surely, Bartimaeus said some bad things about Nathaniel in the first sequel, but it was obvious that the boy’s youth got to him and that he felt some sympathy for him- probably because he reminded him of the Egyptian boy, the only master Bartimaeus seems to have respected. Nathaniel does show some sheds of decency that his superiors lack. Nevertheless, everything is different now. Hence, comes Kitty! As the only individual with some moral decency, she is contrasted sharply with all the other’s characters. This works very well with the premise of the novel that states that magicians are inheritably bad. As I said, I quite liked how the magicians need for power is showed to be pathological in essence. Indeed, I could strike some parallels with 1984, if only there wasn’t so much humour in this one. Everyone who says anything against magicians is, a priori, considered an enemy of the state in much the same way as described in 1984. So, my initial question of whether this sequel would elaborate on politics, revealing more about the power structures and dynamics of this would, could be answered with yes. There is a lot of serious issues tacked through Bartimaeus sarcasm, from slavery to colonialism. He is notorious for his funny remarks on humans, but this time we also get to see another side of him, the one hidden behind his sarcasm. What makes this possible is Kitty. The author digresses into past to give us her background. This was also necessary because her story is connected with the plot in many ways. The reasons why Kitty hates magicians so much are quite relevant for the context of her story. In addition, the injustice Kitty suffered from the hands of magicians allows us to understand her actions. Her character development is handled with care. We understand why she is so driven to take revenge. We understand why even when everything seems futile, she doesn’t stop. Being the moral character she is, makes her invoke admiration in Bartimaeus, invoking him to share his knowledge of history and human societies with her. His discussions and dialogues with Kitty were really interesting and well developed. For me, Bartimaeus was always the star of the story and I was quite happy with his role in this novel. His bond with Kitty seemed quite genuine. All this happens later on in the story (exactly how their paths cross again I won’t say), but I will say it feels very real and meaningful all the same. The fact that spirits are forced to serve magicians is something we’re told from the beginning, but the sequel elaborates on it, comparing spirits (djinns and other lesser spirits and beings) with slaves. This sequel made me sympathize with others djinns, not just our charming Bartimaeus but it was through Bartimaeus conversation with Kitty that I realized how much spirits really hate being materialized and how it takes a toll on them. I think that I said in my review of The Amulet how that first novel seemed (to me) more suitable for young adult and adult audience than for young children because it was quite dark in tone (no graphic description of violence in neither of these two, but there are plotted murders and deaths). However, this one seemed a bit lighter for some reason (even if it discussed serious matters at times) so it might very well be suited for older kids. It could have felt that way because there was a lot of humour in it, in all shapes and forms. Maybe it felt a bit ‘lighter’ because Kitty represents imminent if not evident hope for change. Moreover, Nathaniel’s turn into a ‘serious magician’ is not without a sense of comedy. He might be losing his moral compass, but his djinn is there to remind him of it and make fun of him every step of the way. His intellectualism still serves him well, but he seems lame in comparison with Kitty, who is the heroine of this one. That was refreshing- having a girl be a hero for once! I pretty much liked everything about this one. There were only a few minor things bugging me. One of them was the way that the narration kept switching from first to third person when Bartimaeus would change form. For example, when he would become a cat, the sentence would be- the cat did this or that but then it would return to the first-person narration. Perhaps, this was to give us a better visual perspective of events. It might even serve to enable Bartimaeus to focus on narrating things his way, without having to explain what is he doing on the physical level. This was only a bit irritating at start, soon I got used to it and didn’t mind it. One thing that I did mind was how naïve Nathaniel still was, despite his obvious high intelligence. At a few places, I think he could have been less abashed with what was going on. Apart from that, his character development, with his teenage insecurities contrasted with incredible ambition, was well balanced. Another thing that I felt was lacking was a few good conversations between Bartimaeus and his master. I know that the novel was fast paced and that really wasn’t much place for it (especially with Kitty’s past and present life being introduced) but it would have been fun seeing more dialogue between them. Their changed relationship and estrangement did make sense; I was just left wanting a bit more. In this review, I focused mostly on characters and the world building. I know that didn’t really say much about the plot, but hey I didn’t want to spoil anything for anyone. That- and truthfully as entertaining as the story itself has been (who doesn’t like a nice detective story?) that was not my primary field of interest. However, I will comment on the ending. I must say that the climax is really superb and that it all ties nicely in the end. Towards the end, I kept asking myself how will everything get resolved, but actually the ending felt quite natural. All in all, the sequel was more than satisfactory. I expected it to be good, but not this good. In my view, it was perfect. This hilarious novel is the second in the Bartimaeus Trilogy. The story picks up where the first book in the trilogy (The Amulet of Samarkand) leaves off. Most of the story takes place in London, where the government is made up of magicians. These magicians are all power-hungry, calculating, feckless, craven, jealous, and self-serving to the n'th degree. The 14-year-old Nathaniel is an up-and-coming magician in charge of security operations in the department of internal affairs. He is blamed for This hilarious novel is the second in the Bartimaeus Trilogy. The story picks up where the first book in the trilogy (The Amulet of Samarkand) leaves off. Most of the story takes place in London, where the government is made up of magicians. These magicians are all power-hungry, calculating, feckless, craven, jealous, and self-serving to the n'th degree. The 14-year-old Nathaniel is an up-and-coming magician in charge of security operations in the department of internal affairs. He is blamed for incompetence with regards to two threats; the resistance--a secret society blamed for stealing magical artifacts--and a golem, who is trouncing across London causing major havoc. Nathaniel's personality has changed since the first novel--he is now more power-hungry, and his ethics have taken a bit of a dive, becoming more like those of the average magician. Nathaniel does his best to unearth those to blame for these threats, mostly relying on his captive slave, the 5000-year-old jinni Bartimaeus. Bartimaeus is a lovable character--saucy, sardonic, witty, brave, fatalistic, and street-smart. His cheeky comments do not endear himself to his master, but they make for hilarious dialog. He is sagacious, and ever mindful of his limits and the limitations of the magicians. Kitty is a teen-aged key player in the resistance. She is naive, but persistent, resilient, and somewhat resistant to magic. Her high ethical standards (as with most of the others in the resistance) are in sharp opposition to everyone else. Bartimaeus almost takes a liking to her, for her refreshing honesty, courage, and individualism. Now, I didn't read this book--I listened to the audiobook, narrated by Simon Jones. I must say that Jones is a fantastic reader. His British accents are wonderful, his reading of the crazy skeleton demon is out of this world, and all of the characters come out clearly as individuals. My recommendation is do not read this book--listen to it! 4.5 stars This series is getting better and better and I honestly have no real reason not to give it 5 stars except that I find it really hard to give 5 stars to children and middle grade books, sorry XD Just please tell me what is better than a morally grey 13 year old boy with a djinni as a servant? You can't can you? It's so fascinating to see this in a children's book. I usually don't like morally grey characters because I can never see the reason behind their actions. The idea to hurt people a 4.5 stars This series is getting better and better and I honestly have no real reason not to give it 5 stars except that I find it really hard to give 5 stars to children and middle grade books, sorry XD Just please tell me what is better than a morally grey 13 year old boy with a djinni as a servant? You can't can you? It's so fascinating to see this in a children's book. I usually don't like morally grey characters because I can never see the reason behind their actions. The idea to hurt people and use them even if life did really deal you a crappy hand never really entered my head. But to see this in a child, it's really interesting. I can't put it into words. The difference between a grey character having a flashback to what happened to them to be this way and actually growing up with them till they become what they are is huge to me. And the age makes all the difference too, if it's a younger character I sympathize more but if the character is of a certain age I really have a hard time seeing how certain events can lead them to be the way they become. Especially when they blame others for what happened to them, this always felt so childish to me. Back to this series. I've heard a couple of reviews mentioning how good of an ending this series has and I can't wait. I sense there's a whole lot more to Bartimaeus's character and I really want to see more, I really like him. I like Nathaniel and Katty too. I don't really know what else to say, it seems that all my thoughts scattered away the moment I clicked the I'm finished button XD This really one of those books I would've loved to read and experience as a child, it's not technically and underrated book but I can't believe it's not as hyped as other books. This was a highly entertaining read and I recommend it. My first thought right after reading the book is that it is filled with temperamental and cocky teenagers, equally self-absorbed, bickering and snotty adult magicians and one Mr. Love guru called Bartimaeus. Which actually is not a bad thing cause he cracks me up. Yup, ive been doing that quite a lot when Im reading :)) Character For me, they were pretty much 1-dimensional. The magicians are power-hungry, self-obsessed, egoistic, with really nothing to brag about except they could control the Spir My first thought right after reading the book is that it is filled with temperamental and cocky teenagers, equally self-absorbed, bickering and snotty adult magicians and one Mr. Love guru called Bartimaeus. Which actually is not a bad thing cause he cracks me up. Yup, ive been doing that quite a lot when Im reading :)) Character For me, they were pretty much 1-dimensional. The magicians are power-hungry, self-obsessed, egoistic, with really nothing to brag about except they could control the Spirits. Most of the time, they come off very easy to manipulate. As what Bartimaeus once said, they are all driven by power and greed. Or you know, something like that. The commoners, or the people with no magical aptitude, are either stupid or mindless cowards who spend the rest of the book just being told what to do, clueless or cowering in fear from the magicians. But I get that, we must learn to bow down to authorities but they just come off rather too compliant and dull. And if there are actually people who are willing to fight for their rights, they come off too strongly. Which brings me to the Resistance. what the Commoners lack, the Resistance are abundant of it. Even to the point of being too confident with their abilities that in the end, they ended up being cocky and arrogant themselves but the second book did tackle this one out and accepted the mistakes being made. It was dealt with properly and I liked the closure. I could sympathize with the characters but I couldn't seem to make myself care for them. The only like-able character for me is Bartimaeus, the others fell kind of flat or annoying. It took me a while to warm up to Kitty and by the end of the book, I came to like her too. But not that much. Just enough so I could stop rolling my eyes during her POVs. teehee. Aside from all of that, I still enjoyed reading it. The readers get to be introduced to new environments and delve deeper into the story. Like the history of other Empires, the magicians, djinns. More information were being laid out and there were a lot of actions to keep me excited. There were even time when I have to stop reading it cause I can't handle the suspense just like so: Oh, and by the way, meet Honorius. I couldnt help but imagine him this way :)) But he actually looks like this: So I am truly grateful that mine turned out to be cartoon/anime-ish than it really is cause I might not have slept last night. 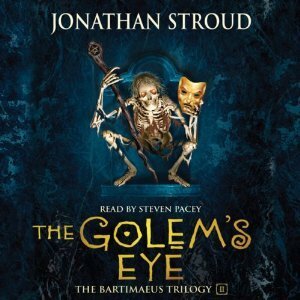 THE AMULET OF SAMARKAND & THE GOLEM'S EYE BY JONATHAN STROUD: So I met Jonathan Stroud last Friday, author of the Bartimaeus triology, of which the first two are out: "The Amulet of Samarkand" and "The Golem's Eye." He came to the bookstore I work at in Petaluma, Copperfield's, and was pretty entertaining. He was the classic English guy writing about a doomed England of magic and magicians and the regular people known as "commoners": average English accent from near London area with some cli THE AMULET OF SAMARKAND & THE GOLEM'S EYE BY JONATHAN STROUD: So I met Jonathan Stroud last Friday, author of the Bartimaeus triology, of which the first two are out: "The Amulet of Samarkand" and "The Golem's Eye." He came to the bookstore I work at in Petaluma, Copperfield's, and was pretty entertaining. He was the classic English guy writing about a doomed England of magic and magicians and the regular people known as "commoners": average English accent from near London area with some clipped Cockney when speaking, but when reading clear, upper class southern England accent; a very ordinary looking guy in a t-shirt and slacks, totally unassuming and seemingly unaware that he's a big famous author who's growing and growing in notoriety. I was talking to him about how I really liked that in his fantasy books involving magicians being separate and higher in social stature than ordinary people like you and me, Stroud pays more attention to what is happening socially with the paradigm, than just telling a story about a hot-shot wizard doing great things. And he seemed happy to know that I had spotted this in his books. That they took a different direction to most of the kids fantasy books out today involving the Harry Potter character, which has now practically become an archetype. In the world of the Bartimaeus triolgy, magicians don't actually have that much power. They have all their control and magic from summoning djinn from another world and using them to do magical things, and all the summoning of imps, djinn, and higher level afrits is done through reading incantations from books. So in this world, the magicians really don't have that much power. The magicians control the entire government from Parliament to the prime minister. And then you have the ordinary people, the "commoners" who are a subjugated people who work in factories and any and all jobs that involve labor. And are meek and always do as they are told, and it comes off as an almost Orwellian distopia. Except there are a few that somehow possess some ability to take attacks from magicians and djinn and not be killed by them and that they are able to see on multiple planes. There are seven planes, humans can only see on the first, and magicians with the aid of lenses can see the first three, while the djinn and afrits are on all seven planes. And this group are known as the "Resistance," as they try to overthrow the magicians and take back control of the country. And then there's the nebulous rest of Europe in which you have the east consisting mainly of the Czechs who are warring against the English and have been for a long time, but are now at truce. So it's a very interesting world with lots going on instead of just some tough wizard kid fighting a bad guy. I recommend it to all who want to read a different kind of fantasy. For more reviews, and author interviews, go to BookBanter. I really liked the first book in the series, but this second one just doesn't match up. I still admire the world-building (a magical system based on good old fashioned demon summoning!) and Bartimaeus himself is still a fun character to read. But Nathaniel has become almost unbearable to read. All the magicians, in fact, read like parodies of arrogant aristocrats. It isn't entirely unjustified, in this world, but it sure isn't fun to read. Sadly, I didn't like the so-called Resistance much more. I really liked the first book in the series, but this second one just doesn't match up. I still admire the world-building (a magical system based on good old fashioned demon summoning!) and Bartimaeus himself is still a fun character to read. But Nathaniel has become almost unbearable to read. All the magicians, in fact, read like parodies of arrogant aristocrats. It isn't entirely unjustified, in this world, but it sure isn't fun to read. Sadly, I didn't like the so-called Resistance much more. Now, I'm generally going to be in favor of a small group of dedicated revolutionaries fighting against extreme odds (see: Les Misérables), but that is not this group. They don't seem to be terribly interested in doing anything other than petty thefts of magical artifacts and minor vandalism, which will do... what, exactly? Also, they were all pretty annoying, too. In fact, the only character I liked at all was Bartimaeus, but not nearly enough of the book was from his perspective. I'm really disappointed, because I do think the world-building is generally very good and the first book was so strong. I am so disappointed in Nathaniel. I really am. I just miss the little boy from the first book so much. I have a feeling that he's the necessary collateral damage from the society that he lives in, and I guess that I can understand that not all of the good guys stay good and vice versa, but I really am sad that it had to end in this way. Well, not end, there is still one more book to go before the ending of this story, but the end of this particular one. I really don't know what is going to happe I am so disappointed in Nathaniel. I really am. I just miss the little boy from the first book so much. I have a feeling that he's the necessary collateral damage from the society that he lives in, and I guess that I can understand that not all of the good guys stay good and vice versa, but I really am sad that it had to end in this way. Well, not end, there is still one more book to go before the ending of this story, but the end of this particular one. I really don't know what is going to happen next, and somehow I don't even want to find out. Whan you get your hopes up this low, I really don't see how they can get back up. But, aside from my sligh negative feelings about Nathaniel, I still think that this is really a book worth reading. Maybe it's not for little children, like I thought so for the first one, because it deals with slightly subtler and not-as-refined human emotions. I don't believe that this series could actually ever have a happily-ever-after by the fairy tale standards, I believe that the ending was as happy as it could get in the given time. And I have to say that Stroud really made a marvelous job when it comes to the subtlety in this book. The story is fascinating. Searching for the golem's eye was very interesting from both Bartimaeus' and Kitty's point of view, and their struggles and their small meeting really left me feeling nice. I don't believe any book ever had that nice feeling attached to it. But still, it was pretty dampened by Nathaniel's behavior, because I got really attached to him in th first book. I only hope that everything will be resolved in the next one. Unless it is still very good, I think the first one in the series is much better. Bartimaeus made me laugh a lot again, but the story is slower and less interesting. The end was very obvious too. In this second book, the Resistance take a more important roll in the story. It is okay, but at the beginning of the book it was everything a mess switching between the magicians and the commoners, and only after a lot of pages I understood the point of such a thing. I will read the third book soon. I hope Unless it is still very good, I think the first one in the series is much better. Bartimaeus made me laugh a lot again, but the story is slower and less interesting. The end was very obvious too. In this second book, the Resistance take a more important roll in the story. It is okay, but at the beginning of the book it was everything a mess switching between the magicians and the commoners, and only after a lot of pages I understood the point of such a thing. I will read the third book soon. I hope it will be so good as the first one and a fine end for this series. I really like this book series so far: Its definitely been one of the better things I have read recently. Its consistently entertaining, light in tone, and populated with memorable characters. The plot moves swiftly, and although there are definitely some borrowed elements, I think Stroud manages to be innovative within certain bounds. I was constantly entertained, and I really loved the snarky djinni. I also loved that they added a sympathetic character in this one. Kitty was wonderful. She was I really like this book series so far: Its definitely been one of the better things I have read recently. Its consistently entertaining, light in tone, and populated with memorable characters. The plot moves swiftly, and although there are definitely some borrowed elements, I think Stroud manages to be innovative within certain bounds. I was constantly entertained, and I really loved the snarky djinni. I also loved that they added a sympathetic character in this one. Kitty was wonderful. She was clever, strong, and brave. I think Stroud was smart to wait to introduce her in this volume, because it felt like I was finally getting the other side of the story that until this point I had only heard from Nathaniel’s perspective. It was good to see through a commoner’s eyes how the magicians affect and control the populace, and how their rule is not necessarily beneficial. This was hinted at before, and Bartimaeus certainly believes this, but it was good to get a clear view of the manipulation that is perpetrated by those in power. I really love Bartimaeus: I just really love how snarky and funny he was. It kept the tone of the book light, and its nice to read a book that isn’t steeped in how seriously it takes itself. I really liked the footnotes, as it felt like a callback to Jasper Fforde to me (another book series I liked). Recommend: Definitely. Its an entertaining read. Цілий рік мені трапляються якісні мультинарративи, від Канетті до Шейна Джонса. А ось тепер до них доєднався і Страуд, всі персонажі якого є антигероями та кожен вибір яких покликаний поставити перед читачем питання сприйняття їхнього морального образу, змушує все більше думати над етичними проблемами цих містично-вікторіанських 90-х. На відміну від Ролінґ, із якою редакція "Ескмо" так нарочито порівнює Джонатана, він не розмежовує світ магів та маґлів-простолюдинів. Він не робить беззмістовних Цілий рік мені трапляються якісні мультинарративи, від Канетті до Шейна Джонса. А ось тепер до них доєднався і Страуд, всі персонажі якого є антигероями та кожен вибір яких покликаний поставити перед читачем питання сприйняття їхнього морального образу, змушує все більше думати над етичними проблемами цих містично-вікторіанських 90-х. На відміну від Ролінґ, із якою редакція "Ескмо" так нарочито порівнює Джонатана, він не розмежовує світ магів та маґлів-простолюдинів. Він не робить беззмістовних спроб втиснути все до магічно-логічних рамок, як це робить мати Поттера. Його світ людяний, шо капець. І саме тим неперевершений. Sigo con la relectura de la saga y, aunque la historia y la atmósfera sea algo más de adulto, sin embargo me ha gustado menos que el primer tomo. Stroud amplía el universo, introduce nuevos personajes y ciudades pero en detrimento del elemento más atractivo de toda la saga: los capítulos narrados en primera persona por el demonio Bartimeo. Una pena que, teniendo algo original y atractivo, lo deje a un lado en un intento de parecer más serio o darle más profundidad a la historia. A veces la virtud Sigo con la relectura de la saga y, aunque la historia y la atmósfera sea algo más de adulto, sin embargo me ha gustado menos que el primer tomo. Stroud amplía el universo, introduce nuevos personajes y ciudades pero en detrimento del elemento más atractivo de toda la saga: los capítulos narrados en primera persona por el demonio Bartimeo. Una pena que, teniendo algo original y atractivo, lo deje a un lado en un intento de parecer más serio o darle más profundidad a la historia. A veces la virtud está en lo simple. Following up The Amulet of Samarkand, this book is just as good. It continues the story of Nathaniel, now John Mandrake, a lonely and quite helpless self-absorbed teenager with an important job and status - you can see where this is going, and you know that it's not good. He has to summon Bartimaeus again and the djinn's not happy about it, but what can he do? You also get a glimpse in the life of the resistance - who are they, what do they do exactly and how they do it, what binds them together Following up The Amulet of Samarkand, this book is just as good. It continues the story of Nathaniel, now John Mandrake, a lonely and quite helpless self-absorbed teenager with an important job and status - you can see where this is going, and you know that it's not good. He has to summon Bartimaeus again and the djinn's not happy about it, but what can he do? You also get a glimpse in the life of the resistance - who are they, what do they do exactly and how they do it, what binds them together and what is their purpose. The guys and girl that made an appearance in the previous book are back and we get a glimpse into their lives and their souls. Slow-paced in the beginning, fast-paced in the end, the book shows the cruelty of the magicians and the sufferings of the ordinary people living in oppression. It shows what makes each type of person vulnerable and how far the characters are willing to go to achieve their purpose. I'd recommend it especially for preteens and teens, but it's a good story for any age. I enjoyed it as much as I did when I was in the 7th grade, and would reread it anytime. From insufferable, untouchable, despicable characters you'd like to tear to shreds to kind and caring characters who become corrupted and turn sour, you'll find a lot of real typologies of people and you'll hope and get mad along with the main characters, like you'd be there with them. "Guarda quello laggiù in fondo. Ha preso la forma di un poggiapiedi. Strano forte... però il suo stile in qualche modo non mi spiace». «Quello è un poggiapiedi Nessuno sta usando quel pentacolo»." Un salto di qualità rispetto al primo. Più impegnato, se così si può dire, più complesso e decisamente più carico di promesse. Lo sviluppo dei personaggi è, come ho già accennato precedentemente, ciò che di Stroud mi lascia più sorpresa e soddisfatta, e anche qui nell'Occhio del Golem l'autore non smenti "Guarda quello laggiù in fondo. Ha preso la forma di un poggiapiedi. Strano forte... però il suo stile in qualche modo non mi spiace». «Quello è un poggiapiedi Nessuno sta usando quel pentacolo»." Un salto di qualità rispetto al primo. Più impegnato, se così si può dire, più complesso e decisamente più carico di promesse. Lo sviluppo dei personaggi è, come ho già accennato precedentemente, ciò che di Stroud mi lascia più sorpresa e soddisfatta, e anche qui nell'Occhio del Golem l'autore non smentisce affatto la sua bravura: la scelta di intrattenersi con un personaggio principale come Nathaniel, che pagina dopo pagina sguazza con sempre più compiacimento in quella fanghiglia di sentina che è l'élite dirigente dei maghi londinesi, che pagina dopo pagina diventa sempre più avido, viscido, pigro, insopportabile, è coraggiosa e già da sola, assieme alla maestria e al buon senso con cui è stata gestito, guadagna al libro non poco merito. In quanto a Bartimeus... se parlassi di lui, non potrei sfuggire al profondermi in banalità su quanto mi faccia ridere e quanto lo adori, per cui starò zitta. Bella la scelta di introdurre come terza co-protagonista una comune; Kitty è stata ben al di là delle mie aspettative. La trama è costruita ottimamente, come già per il primo. Ho apprezzato in particolar modo la conclusione: pensavamo di aver avuto delle risposte, ma con poche riflessioni Nathaniel le spazza via rivelandole per quelle che sono, e cioè nientemeno che un'ulteriore complicazione delle domande precedenti. Come se mi servisse un motivo in più per correre a leggere il terzo. A good sequel to The Amulet of Samarkand. Bartimaeus is back. And his former, temporary master, Nathaniel. Or, as he is known to everyone else, John Mandrake. Nathaniel. once again, summons the djinni on order to save his career. However things go from bad to worse for Nathaniel. From the Resistance, golems, skeletons and inner enemies amongst other magicians, this duo has their work cut out for them. Also, this story brings in a third perspective. Kitty, the thief leader we briefly met in the f A good sequel to The Amulet of Samarkand. Bartimaeus is back. And his former, temporary master, Nathaniel. Or, as he is known to everyone else, John Mandrake. Nathaniel. once again, summons the djinni on order to save his career. However things go from bad to worse for Nathaniel. From the Resistance, golems, skeletons and inner enemies amongst other magicians, this duo has their work cut out for them. Also, this story brings in a third perspective. Kitty, the thief leader we briefly met in the first book. She is a active member of the Resistance. However, things for her go bad to and soon all three meet up, once again. Overall, well done. I am very much enjoying this series. Bartimaeus is still a great character, however Nathaniel has become career and self obsessed and often frustrating. I loved learning about Kitty, her backround, personality and more. A strong, well-written character. Even Nathaniel is, in a unlikeable way. The story is nicely paced with a blend of past and present. Also a great character blend. It made for a fun read. These are interesting (I use that word a lot don't I? Maybe I should check a Thesaurus.) books. The "human" lead character, John Mandrake/Nathanial is definitely an acquired taste. You sort of want him to succeed, but on the other hand you see the Magicians as what they are, morally repugnant. In the first book, there seemed to be hope for Nathanial to turn out, "all right". But he's obviously turning into just another ambitious, selfish, lying, magician. Then there's Bartimaeus, a jinn (genie, d These are interesting (I use that word a lot don't I? Maybe I should check a Thesaurus.) books. The "human" lead character, John Mandrake/Nathanial is definitely an acquired taste. You sort of want him to succeed, but on the other hand you see the Magicians as what they are, morally repugnant. In the first book, there seemed to be hope for Nathanial to turn out, "all right". But he's obviously turning into just another ambitious, selfish, lying, magician. Then there's Bartimaeus, a jinn (genie, djinn)or....demon. Not a being you'd expect to like...but then compared to John Mandrake, well... This is the second book in the Bartimaeus trilogy and the story picks up a few years after the close of the first. Nathanial/John Mandrake had (apparently) agreed not to call Bartimaeus again...apparently, as that was the jinn's understanding but well, John decided he hadn't actually taken that vow.. These books are well done, give a good story with lots of adventure and laughs (from the narration as well as the tale itself). The pace and ideas continue in the second installment of the Bartimaeus Trilogy with The Golem's Eye. Kitty's character gets more exposure and "page time", while Nathaniel, now a very pompous 14 year old working high up in the government, tries to track her down as leader of the Resistance, and hopefully find a link between her and the giant clay golem trashing London. At risk of making the ruling class (the magicians) look incompetent, a lot of pressure is on Nathaniel's young shoulders. Bartim The pace and ideas continue in the second installment of the Bartimaeus Trilogy with The Golem's Eye. Kitty's character gets more exposure and "page time", while Nathaniel, now a very pompous 14 year old working high up in the government, tries to track her down as leader of the Resistance, and hopefully find a link between her and the giant clay golem trashing London. At risk of making the ruling class (the magicians) look incompetent, a lot of pressure is on Nathaniel's young shoulders. Bartimaeus, true to form, feels he is the only one truly sensible. With his entertaining views on everything from other djinn to Nathaniel himself, he continues to be the most engaging character. The wit and satire also continue, and the ending has a satisfying climax as we draw closer to solving the over-arching plot. در این کتاب همان روندی را که در کتاب اول برقرار بود، این دفعه برای سه نفر انجام شد؛ ناتانیل، بارتیمیوس و کیتی! سرنوشت هر سه جداگانه بیان میشد تا اینکه در اواسط کتاب به هم رسیدند و دوباره جدا شدند. الان احتمالاتی که با دانسته ها میتوان گرفت: ۱. میک پیس زیر همه این توطئه هاست و از هاپکینز به عنوان رابط خود استفاده کرده است. ۲. میک پیس و هاپکینز، یک نفر هستند. تنها کتاب آخر که میتونه حقیقت رو مشخص کنه! CONCLUSION: it was a good read. First, the book's contents. Each one or two chapters is of a different characters point of view, and the story progressed in a amazing way, with some flash backs and so. The whole point is about a fourteen-year-old magician Nathanial and his tasks and missions being the assistant of the head of internal affairs which concerns a disastrous magical creature and a group of thieves. Kitty, after being wrongly accused, was driven to these criminals and both she, Nathan CONCLUSION: it was a good read. First, the book's contents. Each one or two chapters is of a different characters point of view, and the story progressed in a amazing way, with some flash backs and so. The whole point is about a fourteen-year-old magician Nathanial and his tasks and missions being the assistant of the head of internal affairs which concerns a disastrous magical creature and a group of thieves. Kitty, after being wrongly accused, was driven to these criminals and both she, Nathanial and the djinn Bartimaeus began a terrific adventure. The story, if linked to reality, mentioned how unfair the differences of the rich and poor/ good-looking and not so / normal and abnormal/ young and old... (magicians and commoners or Nathaniel with the other magicians) are, and about the complex feeling of desire for leadership or power ( Nathaniel and Duvall). Also, it explained how important is conscience ( Kitty and Nathaniel) and the laws and judgements ( Kitty). I didn't even read the first book and I had no trouble reading this second book at all! There is nothing i don't understand and nothing confusing... Jonathan Stroud had done it, whereas the others couldn't. No bewilderment about the planes... the stuff about the government...the idea of a djinn...it's perfect. This technique of explaining some things by a note at the bottom of the page is quite clever too. The writing is just too fabulous. And I realised something else as well. Stroud here is SO full of WORDS. Even though knowing quite a few words more than people of my age, I filled nearly an entire page of words I've met and said hello in the book but didn't know them enough to start a conversation ( just a little lame metaphor here. skip it if you don't understand it). Here are some examples: flotilla, subjugate, sauerkraut. I do have a vague understanding to some words, of course, but that's probably only because he used them so appropriately. Next is his WAY of using those words and arranging them into a perfect sentence. Beautiful simile, personification, metaphor...etc. is easy to be perceived. For example : ( ...dishes strewn with sausage scraps, the relics of his afternoon consumption.) , (I didn't like it: too many windows ablaze with the light of the dying sun; it was impossible to tell who might be looking down from them.) ( One moment he was there, the next he was gone, and something heavy was being dragged away from her and down the steps, BUMP, BUMP, BUMP.) ... etc. See? How he used the colons and semicolons, the words and sound effects to his thriller? It's just so magical. His way of DESCRIBING. I cannot possibly use words to express just how PERFECT he describes his scenes and objects portrayed in them. But maybe he can. Because the way he writes the shadows on the walls and how the illumination produced the shadows are genuine; the way he talks and show the setting's scene to us readers are aesthetic. Believe you me ( that's actually a common phrase used in the book). You might not have noticed so, because Stroud probably kept you quite engaged in the plot and the excellent pacing and the emotional characters. If you look closely-in some parts of course, not all of them- you'll see he sometimes describe the scene as the narrator or main character of a particular chapter's vision. For example, Stroud was describing the spheres of a long shelf... and to guide his next object into the setting, he then wrote-"Kitty shuddered and turned to the main focus of the company's attention-the marble sarcophagus directly below the shelf..." You see, everything was cleverly put. Last but not the least, AMUSEMENT and HUMOR. That's there, too. It's not only a grim, thrilling tale, but funny occasionally, making you laugh out loud. Bartimaeus is SO funny. He openly produced a fair number of comical scenes and comments. Not gonna tell you what it is in case of spoilers. CONCLUSION: it was-is-a good-GREAT-read.